For all the handy gals. If your man is not pulling his weight, then perhaps you need the DIY Ladies Tool Kit. 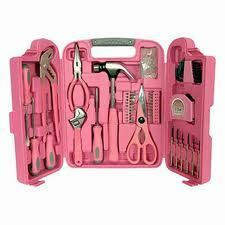 It contains a comprehensive choice of quality manufactured tools in hot pink. Perfect for doing repairs at home and around the office. There are two main things stopping most women from taking on a little more do-it-yourself action in the home. One - it's impossible to find anything in that "shed of his". And two - wearing a tool belt would be fine, except it's impossible to find shoes to match! The DIY Ladies Tool Kit solves both!